Hitman Video Slot Guide & Review - Casino Answers! 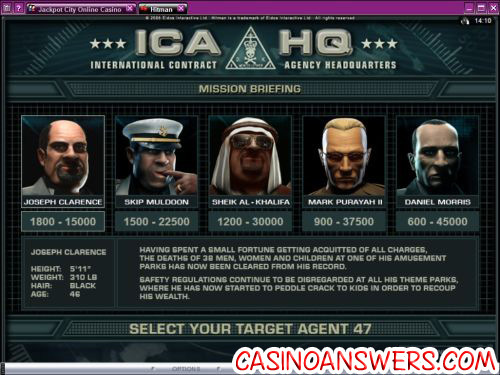 Hitman is a 5-reel, 15-line video slot developed by the casino software provider Microgaming. It features expanding wilds, scatter wins, a free spins feature and two bonus games. You can play the Hitman video slot at Jackpot City Casino and Nostalgia Casino.Play at this years #1 online casino for United States - Slots.LV. The Hitman slot machine is based on the Hitman video game series, which has also spawned a film. When you first enter the video slot, you are introduced to the Hitman video slot with an excellent intro movie. The graphics of this video slot are very good. It’s one of the best-looking Microgaming video slots we have seen, perhaps the absolute best. It looks very sleek, like something you would see out of a video game. The symbols in the game are most of Hitman’s weapons. Some of them are animated, which you will see when you have a winning combination. Coin values on the Hitman video slot are $0.01, $0.05, $0.10, $0.20 and $0.25. To complete your bet, you must set how many coins you wish to play (up to 20) and how many paylines you wish to activate (up to 15). You can bet anywhere from the absolute minimum of $0.01 up to $75 per spin. To change the active paylines, click on the buttons at the sides of the screen or use the “Lines” button. To change the number of coins you are betting, hit the “Coins” button. Once you’re ready to play, hit the “Spin” button. To spin the reels with all 15 paylines active, betting all 20 coins at your selected coin value, use the “Bet Max” button. The Hitman slot machine has an Insignia bonus feature where you can win up to 6000 coins. This feature is triggered when the Insignia symbol lands on the first, second and third reels. You will have the choice of selecting one of three insignias on the screen to win a prize. Your prize in the bonus game has been multiplied by the total bet staked. When three or more 18 free spins scatter symbols appear anywhere on Hitman’s reels, you will win 18 free spins with a 2X multiplier. Bonus features and expanding wilds can occur during free spins. Free spins cannot be re-triggered. All bets and lines played during the free spins feature are the same as the spin that triggered the free spins bonus feature. Hit three laptop bonus symbols and you will trigger the Hitman video slot’s Contract bonus game where you can win up to 270,000 coins. The exciting thing about the bonus is that when you have two, the game will slow down to increase the drama on the fifth reel. In the bonus game, you are taken to a screen where you must choose one of six targets. Each target will display the range of potential prizes. You will be briefed on who each target is and why he must be stopped. Once you have chosen your target, you will be given a value. The next step is to choose your weapon. You will then be awarded a random multiplier as you execute the target. Your total win will be the original target value multiplied by the random multiplier. Hitman’s Contact bonus game is easy to play and gives players a good chance to win a large prize sum. The Hitman wild symbol is Agent 47’s traditional arms crossed holding two guns pose. If the Hitman wild symbol appears on reels 2, 3 or 4, it will become an expanding wild to complete any possible wins on that reel. The expanding wild feature will substitute for all symbols except for the scatter and bonus symbols. The expanding wild feature can occur during the free spins bonus feature. The Hitman wild symbol does not pay out on its own. The Hitman video slot’s top fixed jackpot is Agent 47 holding a sniper rifle. Five of these symbols are worth 4000 coins. There are other significant wins in the regular slot game, including 2000 coins, 1500 coins and 1000 coins. Switch the Hitman slot machine into expert mode (found below the video slot game) and you will be able to use Hitman’s autoplay feature. It’s not as detailed as some of the other Microgaming video slots. You can choose the number of autoplay spins (5, 10, 25, 50, 100, 250 and 500) and your stop settings are to stop once all of the spins are complete or to stop if a win exceeds or equals a value you can choose (100, 500, 1000, 5000 or 9999). There are also quick buttons to play either 5 or 10 spins with no advanced settings. You can stop the autoplay feature at any time. Going out of a limb, we would say that the Hitman video slot is probably the best video slot found on the Microgaming platform and one of the best 15-line video slots that you can find at any online casino. We strongly recommend that you try out this slot, but please be forewarned that Hitman is not for sissies. If you’re looking for the best casino to play the Hitman video slot at, you can get a 100% up to $500 signup bonus at Jackpot City Casino. Where can players from the United States play the Hitman video slot? Players from the US are unfortunately unable to play at Microgaming casinos for real money. Gamers will love some of the iSlots found at Rockbet Casino, such as Fixer Upper, Heavyweight Gold, Psychedelic Sixties, Rock On and much more. 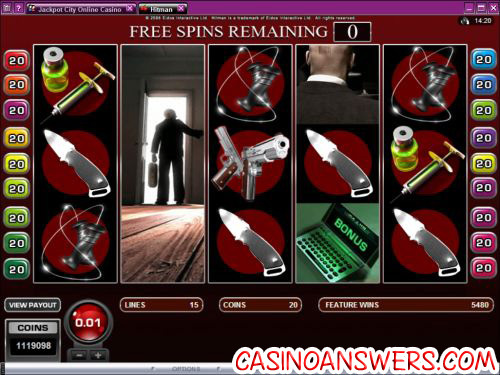 Do I need to download any software to play the Hitman slot machine? Jackpot City Casino offers a no-download Flash casino in addition to the download version. One of the many games available in the instant play Flash version is the Hitman video slot, so you are in luck. If you have any problems playing the Hitman flash game in your browser, make sure you have the latest version of Adobe Flash Player installed on your computer. Does the Hitman slot have a progressive jackpot? Instead of a progressive jackpot, Hitman has two different bonus games and a free games feature. The top fixed jackpot on the Hitman video slot is 4000 coins. If you’re looking for a Microgaming progressive jackpot, please read our Mega Moolah Progressive Jackpot Slot Review. What video game slot machines are there? What video game fruit machines are there?